In our previous tryst with Second World War, we discussed about some of the biggest cannons used during the time. Well, this time around, we go from size to abnormality – with the military powers back then trying out their luck and dabbling with the strange (yet still vicious) kinds of weapon tech that may seem ludicrous to observers. So, without further ado, let us check out the 10 most bizarre weapons from the World World II period that were envisioned to be used (or were used) during the almost 7-year old stretching conflict that embroiled most of humanity. This is no code-name; the weapon pertains to exactly what the name suggests! It has been documented that an SOE (Special Operations Executive) officer had successfully procured around a hundred rats from a biology lab, after he posed as one of the students. The rats were then skinned, stuffed with plastic explosives and then sewn back together. The dead rodents were to be placed in strategic locations that could cause huge explosions, like beside the boilers. The idea was that German soldiers would notice the dead rat, and as a usual practice they would throw it in a fire – while the resultant rise in temperature would detonate the rodent carcass. 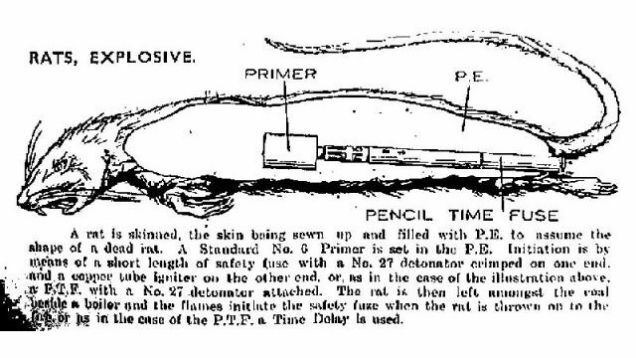 However, the explosion part was not a success, as German authorities had already confiscated many of such rigged-rat specimens. But according to SOE, the odd tactic did create a sort of panic inside Germany, with considerable efforts being invested in a continent-wide hunt for the rats. 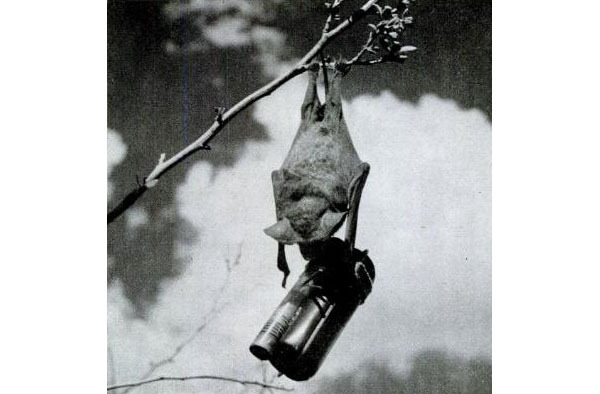 The Americans joined in the weird weapon bandwagon with their idea of attaching diminutive incendiary bombs to bats, and then letting loose a colony of these creatures inside Japanese settlements. The bats were expected to be carried inside a container that could be dropped from an high elevation, presumably from a bomber. An integrated parachute from the container would open at around 1,000 ft altitude, which would allow the compartments inside the shell to be released with over a thousand bats in them. 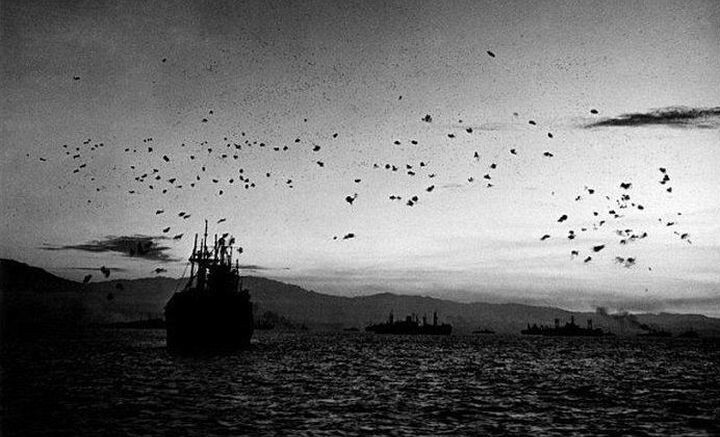 The plan entailed that these bats would make their way across different parts of a city, and then their timer-delayed bombs will be detonated that would cause fires raging across the primarily wooden Japanese structures. Unsurprisingly, the complicated tactic didn’t work out when during a test run, the bats nestled inside the testing facilities – thus causing widespread fire damage to the buildings. Moreover, the later-designed atomic bomb proved to be a more brutally effective solution for concluding the Japanese war theater. The bizarre brainchild of Dr. Mario Zippermayr, who was an Austrian physicist and also a member of the Austrian Nazi Party, the Whirlwind Cannon was conceived to create artificial waves of air that could potentially cause damage to primarily flying enemy aircraft. These pressurized whirlwinds were directed by specially designed nozzles that made use of explosions generated in cannon’s combustion chamber. 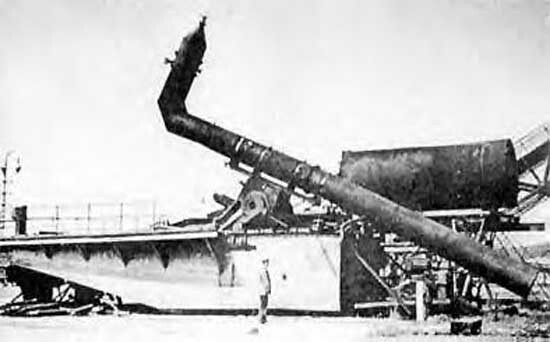 To that effect, two Whirlwind Cannon prototypes were manufactured by German engineers, and both failed make their ‘wind waves’ reach the high altitude required for catching up with conventional planes. Zippermayr still stuck to the task of increasing their range – but the war came to an end before the timeline, with one of the cannons being actually captured by the Allied forces in Sachsen-Anhalt, while the second one was destroyed during a transportation blunder. Imagine a rocket with tethered wires and parachutes! The Unrotated Projectile by the British, pertained to this odd design scope, and it was envisioned as a weapon that could be used as an aerial mine field. The short-range projectile could be fired from an anti-aircraft system, and the rockets would basically float in mid-air with the help of their wires and parachutes. So, when enemy planes passed through the zone, every aircraft would be in potential danger of getting entangled in the wires – which in turn would lead to the impact of the rocket with the flying object, thus causing a high-altitude detonation. As for the practical scheme of things, even slightly windy conditions could have precariously made the parachuted rockets drift back to the allied base. 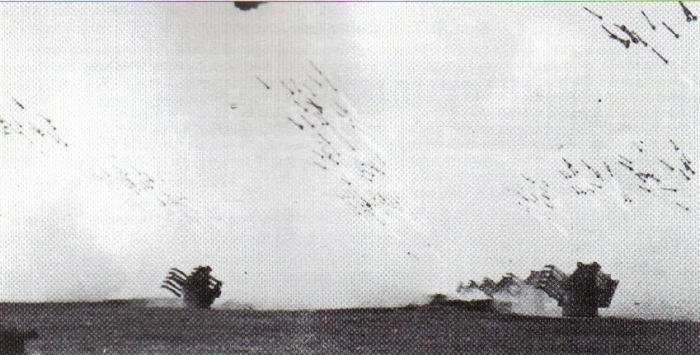 In any case, the Unrotated Projectiles were still used occasionally, at least during the initial phases of the war. Rats, bats and now pigeons! 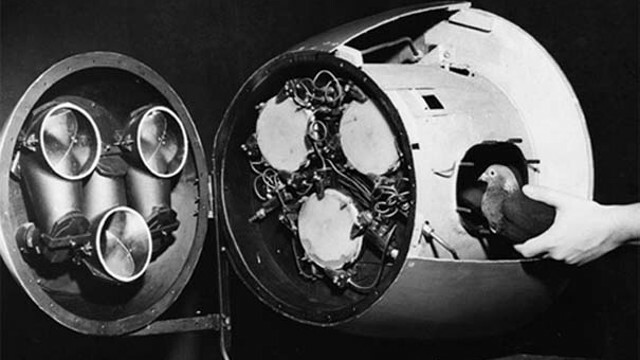 American behaviorist B.F. Skinner started the so-named ‘Project Orcon’ (an abbreviation for organic control), which involved the using of pigeons as ‘intelligently’ guided missiles. The interesting (yet obviously heartless) working scope related to the so-called guidance system of the pigeon-borne explosive. To that end, the control mechanism consisted of a lens that projected the image of the target at hand. Now, the pigeons were trained to peck on this target through four levers (for navigating directions). In essence, the way the pigeon pecked on the levers, ultimately decided the course of the missile. For training and encouragement, the birds were initially fed corns that were kept on the central target on the lens. But finally, the $25,000 project was called off, when the National Defense Research Committee decided that an artificial electronic guidance system would probably work better.